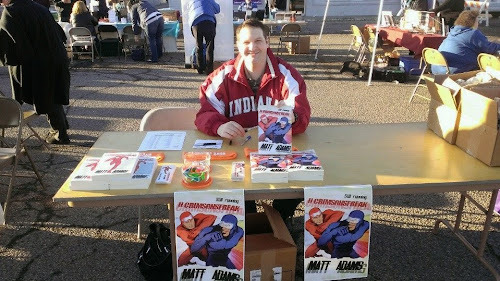 I took my Crimsonstreaking act to Madison, Indiana, this weekend for the Fourth Annual Authors Fair presented by That Book Place. I've been to the event before and it's usually pretty busy. Last-minute construction on the Milton-Madison Bridge certainly didn't help with foot traffic. I sold a few books, but the best part was talking to other authors and swapping stories. A couple of big comic book fans also interviewed me...and things got awkward (in a good way!). They were excited that I'd written a superhero novel and had lots of questions about the book. Both of the interviewers decided to sit (or stand, more accurately) in on the interview until we realized it wasn't working very well. It's the same reason I loathe three-man booths in sports. Anyway, we dumped out of the interview and I did a one-on-one with one of the hosts. Both guys were good sports about the whole thing. We're not done Crimsonstreaking in southern Indiana! 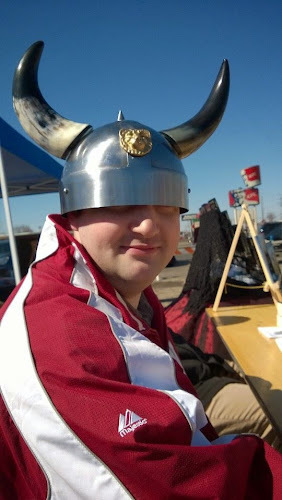 On March 29 and (maybe) March 30, I'll be down at Hanover College for Geek-a-Thon, their version of Comic Con. They'll have panels, movies, games, and plenty of activities. Since the theme is "Marvel vs. DC," it's certainly an appropriate forum for Crimsonstreak and company. Thanks to all who put the event together. I'd also like everyone to know that my wife indeed got to eat at Frisch's Big Boy. She ordered the patty melt. She was very excited about that.